Most causes of pain in these region are muscle-related. 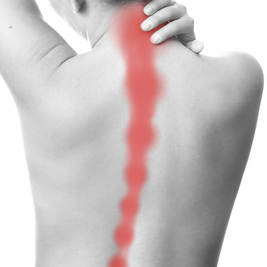 It is a relatively immobile area, as the ribs form a solid framework that limit movement, but it is also the area your neck and shoulders attach onto, and the instability of these areas require some strong muscle attachments which can become painful if they are being used too much or in the wrong way. Your upper and mid back are collectively known as your thoracic spine – this is the area from the top of your shoulders, right down to where your last rib joins your spine. Pain in this area is often caused by muscles and joints, but there are a few conditions that your Chiropractor will be keen to rule out before starting to treat any tension and dysfunction found. A lot of the internal organs – which one of my lecturers at college so endearingly used to refer to as your “giblets”! – can refer pain to this area if they are having a problem. This includes your heart, the large blood vessels in the area, your gall bladder, stomach and pancreas…among many others! In order to make sure that these areas are not what is causing your symptoms, your Chiropractor will go through a detailed examination of the history of your complaint, your general medical history and any other complaints you are currently experiencing. If there is anything to suggest a non-musculoskeletal cause of your pain, the Chiropractor will then investigate this further during the physical examination. If they are suspicious that any of these complaints are causing your symptoms, they will immediately refer you back to the appropriate healthcare professional for further testing. Assuming that is all clear, however, we are free to assume that it is something in the muscles and bones of the area causing your pain. In this area, posture is key. It is becoming increasingly common for Western societies to become distinctly hunched over through their shoulders – referred to as an upper-crossed posture in Chiropractic circles. The shoulders round forward and the curve of the upper back is exaggerated. This puts significant strain on the muscles in your back, particularly those responsible for moving your shoulder and shoulder blade, and those which come into your upper back from your neck and are responsible for holding your head up. So while the short term answer to these problems is to work with the muscles and joints to relieve the tension, if your posture is faulty then the symptoms are only going to come back again. It is therefore vital that we address your posture as part of the course of your treatment. Once you are able to sit and stand more upright, the strain is massively reduced on your thoracic spine and it becomes much less likely that the problem will recur. Besides the spine, the other significant structure that your Chiropractor will look at during your examination is your rib cage. I have seen many patients walk in, holding themselves very carefully and breathing quite shallowly. When asked, they will inform me that they are unable to turn without getting a stabbing pain right through from the front to the back of their chest, and the same pain happens if they try to take a deep breath in. The simple reason behind this is that the joint where the rib attaches to the spine has become restricted in its movement, so every time it is asked to move (when you turn or take a deep breath) it sends pain right round your rib. The muscles around it, including the muscles between your ribs, will also become tight to protect this. In a slightly odd way, I absolutely love treating this particular condition – because the results are often dramatic and instantaneous! A person walks in, unwilling to move and unable to breathe freely, and after a short treatment they get up off the bench, take a deep breath in and break into huge smiles! Of course, it is likely that it will gradually become restricted again and so a few treatments are required to persuade the joint to stay as mobile as it should be, but even then it is one of the faster healing conditions to recover from. In other words, once conditions from the “giblets” have been ruled out, treating pain of the thoracic region is simply a matter of restoring movement to the spinal and rib joints using adjustments, relaxing off the muscles that are working overtime with a bit of soft tissue work and resolving any postural deficiencies that caused the problem in the first place, and off you go! So why not get your pain looked at today by contacting us at Shifnal Chiropractic Clinic, and start yourself on the road to a healthy, pain free life once more.